I made my friend Jack a guitar for his birthday. It’s a flying V painted like the old-school Star Trek insignia.Â Like I did with my SG-knockoff build, I used a Saga guitar kit. This one is the FV-10. The first problem was that the neck they sent me arrived completely busted. The seller was slow but helpful and did get a replacement neck shipped out. As I was taping it up I realized it did not have mounting holes drilled. Raaah! Well, I had to test-fit it to the body anyhow, so I drilled my own. I sprayed the face yellow, and the sides and back black. 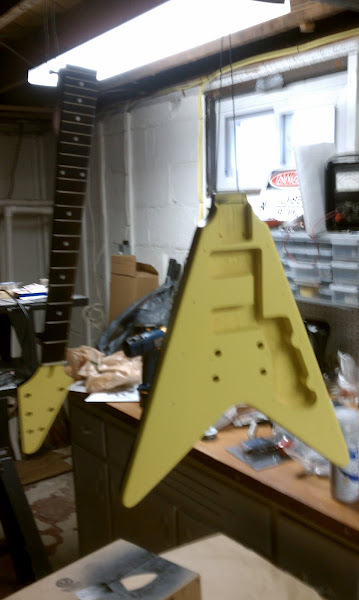 The neck is black also, and the face of the headstock yellow.Â There’s a couple blemishes that I tried to touch up by hand. It was either that or start the paint over. Â The electronics in this kit are pre-wired to the faceplate, so I had to accept a white faceplate. I think it still looks OK. I have to admit, if I were to start over I would go with a more gold or mustard color instead of super bright yellow. I also would have done a body with rear-mounted electronics. That way I could have decorated the front more like an insignia (on this kit the pickguard covers up the routs for the electronics, so I couldn’t leave it off). Other than that, I like it. When I started to assemble, I realized the mounting holes I drilled were not deep enough (I was scared of punching through to the fingerboard). Â I will measured the mounting holes on the busted neck and started again. You can see in the closeup of the headstock that the tuners are a bit misaligned. That is because 4 out of 6 of the mounting holes were in the wrong place. Arr. There’s also something funky with the electronics. Sometimes when you flip the selector, everything drops out. Another flip (out of and then back to the same position) will bring everything back. It’s such weirdly specific behavior, it doesn’t seem like a loose connection. Due to my zero knowledge of guitar electronics, I don’t know how to diagnose it. The electronics were pre-wired, so it’s not something I did. It’s probably a bad switch. The next guitar I build will definitely NOT be a Saga kit. Before I built the SG, I had heard a lot of complaints about them but it was so cheap I figured what the hell. I guess I lucked out with the SG (which went very very smoothly), because this one had so many problems. I barely play guitar, and have never played an SG, but for some reason I’ve always loved the SG body. And I love a project! It was $179 on ebay so I figured it would probably sounds like a $179 guitar. Saga cannot legally sell the kit with the Gibson headstock shape, so you have to cut the “blank” headstock yourself. I used my bandsaw and it came out OK. I had BIG trouble with the spray lacquer I ordered from StewMac. I followed the instructions (warm up the lacquer, use broad strokes, start and stop off the guitar) but it still spit a lot and I ended up with a lot of blobs and runs. I stripped the whole thing off. In retrospect, part of the problem was probably the sealer on the kit. OK, purists, avert your eyes: I ended up going with wipe-on Minwax Crimson. It did not come out very red, but I liked the tone and stuck with it. I also used Minwax wipe-on poly for the gloss coat. It went on very easily and has a nice gloss to it. I guess I’ll find out how it holds up. I built a stand out of PVC so I could hang it up as I went along. It worked out really well, and I can break it down and put it away until I need it for future projects. Once the neck and body were finished I had to black the headstock. Here I did use the StewMac gloss black and it came out good. I used the Gibson logo as a base to make my own. I printed it onto a waterslide decal and then put clear coat and then lacquer on top. I got all the electronics together pretty easily – no soldering, just click together and heat shrink tubing. Then I just added the tuners, all the knobs, the pickguard, and strung it. Everything worked on the first try, I couldn’t believe it! The action and intonation were good. Now I just need to learn how to play better. Looking forward to another build soon.